First, a question for our male readers: you are 36 years old; you are married and have two children – a boy, Shaun, 11, and a girl, Kairi, 10; you live with your wife and children in an upscale neighborhood in the suburbs of Los Angeles; you are a sushi chef at a Michelin Star restaurant – not just a chef but the chef in the number one position at the bar, responsible for oversight of the operation of the restaurant; you have a large following of loyal customers, including chefs from other area restaurants; now you have an opportunity to leave your job and become the owner of a sushi restaurant of your own. Do you take this step? Do you give up the comfort and security to go into the risky business of restaurant ownership. Now, a question for our female readers: you are the wife of the man in this scenario; you are a registered nurse in the operating room at UCLA Medical Center; your life is comfortable; you have time to devote to your children; your husband works long hours five days a week but he has Saturdays off to spend with you and the kids in his current job; this new venture will consume much more of his time; the risk of restaurant ownership that lies ahead, though not as large as myth would have it, still represents a risk for both of you, the children and your lifestyle. How supportive can you be in the part of you that you keep secret? Do you have misgivings? If you do, would you tell him? Were you tempted to try to talk him out of it or can you inhale, support his dream and say, “Let’s go for it”? Sounds like the stuff of a relationship novel, doesn’t it? For Mark and Lorevell Okuda it’s the stuff of real life. For the last three years, Mark has been the lead sushi chef at Asanebo in Studio City, CA, one of the best known and widely celebrated sushi restaurants among the nearly 9,000 located in Los Angeles. In that time I may have sat at Mark’s station at the sushi bar some 75 times. On most of those occasions I ordered omakase – chef’s choice – and sat back and let Mark dazzle me with some of the most creative sushi and sashimi dishes I’ve ever eaten. While I was out of town a couple months ago, I got an email from my sushi bar buddy, Allan Sasaki, in which he told me Mark was leaving. Allan has been in the same seat at the sushi bar at Asanebo about 45 Friday nights a year for some 14 years. I met Allan when I sat next to him at the bar about three years ago. We chatted, became friendly and sat side-by-side at Mark’s station scores of Fridays since. Friday nights at Asanebo are like a scene from the old TV show Cheers, “where everybody knows you name.” In that recent email, Allan told me the following Friday would be Mark’s last Friday at Asanebo. I knew instantly it would take something major to keep me from being there to wish him good luck. Between courses that Friday night, Mark told me of his plans. He had purchased an existing restaurant called Brother’s Sushi, which had been operated by the same owner at the same location for 36 years. Mark was going to spend time in the restaurant to get to know some of the customers and staff but he wasn’t planning any significant changes until he got a better feel for the place. That notion was doomed to an early exit. The restaurant had a solid and devoted customer base in the West San Fernando Valley, 13 miles west of Asanebo. I looked at the menu online and found 25 sushi rolls and very little in the way of fish for Nigiri sushi or sashimi. At Asanebo the next Friday I told Allan what I had found and wondered how Mark’s creativity would fit at a restaurant that feature sushi rolls and little else. After spending a week at the restaurant and chatting with customers and staff, Mark decided he could eliminate 14 of the rolls and expand the offerings of fish for nigiri sushi and sashimi. “Most of the customers and members of the staff seemed enthusiastic about the change,” Mark said. After seeing them in action and working beside them for a week, Mark decided to keep any staff member who wanted to stay and to add a few more people in various roles. In recent years, Mark said, he had several opportunities to buy various places but didn’t think he was ready. He offered to buy this same restaurant two years earlier, but the owner was not ready to sell. Now Mark and the owner each was ready to make the move and Mark’s dream of owning his own place was going to come true. All seemed good to go until Mark and crew started to deal with what he believed would be simple cosmetic and structural issues. Anyone who has done a kitchen or bathroom remodel at home can guess what happened next. The roof was flat and not pitched for drainage; puddled water had leaked through to the ceiling. There would have to be a new roof. Part of the ceiling sloped toward the front of the restaurant and was uncomfortably low. New, higher ceiling. The concrete floor in the kitchen didn’t slope toward the drain. New concrete floor. The stove and refrigeration unit needed to be replaced. New cold storage areas were needed. The sushi bar counter top needed to be upgraded and the refrigeration unit on the top of the sushi bar was broken during the remodel and needed to be replaced. A new entrance and door were needed to permit handicapped access. Retiling of the floor and remodeling of the bathrooms were part of the original plan. Was Mark having second thoughts, regrets? Not for a minute. I stood with him and Lorevell amid the dust and clutter on a Sunday afternoon. Still no glass refrigeration case atop the still unfinished sushi bar. A soon-to-be-discarded and very large refrigeration unit sat behind the kitchen. The soon-to-be-replaced stove still needed to be removed and a new one installed. New tiles were being installed in the seating area. But Mark was confident they would be ready for a test run dinner service for staff by Friday, a soft opening for family and friends on the weekend an a grand opening nine days hence. Mark has been in and around sushi restaurants virtually all his life. His mother, Nobuko, worked as a waitress at a sushi restaurant in Encino, CA for nearly 30 years. His father, Masashi, was a U.S. National Park tour guide. Both parents were born in Japan. The family lived in North Hollywood when Mark was born. 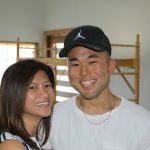 While attending the magnet school in communications technology at Grant High School in Van Nuys, Mark also attended a Japanese school, where he studied the language of his parents. After high school, Mark enrolled at California State University in Northridge, where he majored in food sciences because “I wanted a food-related major.” He minored in Japanese. Nights and weekends, Mark worked at a sushi restaurant in North Hollywood. He started as a busboy and server while being mentored in food preparation. At the age of 19, when one of the chefs left the restaurant, Mark applied for the job. Thirteen years later he still was there but feeling stagnated and in need of a change. He asked a friend, who worked at Asanebo, if there might be a chance for a job there. To his surprise, he was hired. He spent six months in the kitchen, preparing hot food, and learning more about sushi preparation. Clearly, under the tutelage of owner and master sushi chef Tetsuya Nakao, Mark learned well. Three years ago, when the resident number one sushi chef at Asanebo decided to move back to Japan, Mark was installed in that pivotal post. Out of respect for his co-workers, Mark does not identify it as the number one post, but that’s what it is at any sushi bar. It didn’t take long, maybe just one or two Friday nights, and I was sold – Mark Okuda became my go-to sushi chef. One thing weighing in favor of Mark and Lorevell as they take this step: the horror stories about the failure rate of new restaurants are a myth. Somehow, there developed a conventional wisdom that as many as 90% of all new restaurants closed within the first year. Not true. Forbes reported not long ago that the rate was only 17%, lower than the first-year failure rate for real estate offices or other service-providing businesses. Amazing piece, well written! A mini biography with a food reviewers angle. That’s my ‘cuzzo’, looking forward to experiencing what you have Larry! When is he opening, can’t wait to go!